“One down… thirteen to go!” shouts Monét X Change as the remaining queens of RuPaul’s Drag Race Season 10 strut into the werk room fresh off of Vanessa Vanjie Mateo’s elimination last week. On the season’s second episode, which aired March 29th, the queens learned choreography and performed in the lip sync extravaganza PharmaRusical, a pill-poppin’ pun-laden musical about pharmaceutical drug commercials (yes, you read that right). But before the queens bust out their Broadway chops, Andy Cohen, yes THAT Andy Cohen (who is visibly a solid 1.5 feet shorter standing next to glamazon RuPaul, btw) stops by for a little hoedown showdown mini-challenge. The Vixen and Asia emerge as the winners of the country-themed mini challenge, which asked the queens to dress up in farm girl attire and perform entertaining freestyle choreography. As the winners, Vixen and Asia select teams for the musical performance, choreographed by the one and only Alyssa Edwards. Not only did we get to reunite with the tongue-popping Drag Race legend Miss Edwards, but we got some extra special guest judges, too: Pop star Halsey and author, actress, model, television host, and Sylk in Mariah Carey’s Glitter, Padma Lakshmi. So what were the fiercest moments in Episode 2 of RuPaul’s Drag Race? Let us guide you. She may have been the first queen to go on last week’s premiere, but a name that we certainly NEVER will forget is Vanessa Vanjie Mateo. (“Vanjie…Vanjie…Vanjie…”). The episode begins with the thirteen remaining queens huddled in the werk room after Vanjie’s elimination, giggling over the eliminated queen’s knack for repetition. Eureka points out that even Ru and Michelle were laughing when Vanjie exited the runway — cut to one of the most genuine moments of friendship we’ve ever witnessed on the show between longterm show biz partners Michelle and RuPaul. “I didn’t get the name — what was it?” Ru sarcastically whispers to Michelle, who then repeats “Vanjie” over and over as Ru struggles to stifle her laughter. Now, Ru’s laugh is ICONIC (it’s literally the transition sound between the show’s scenes), so hearing Mama Ru attempt to mute her laughter was kind of life-giving??? Her eyes literally water as she whispers to Michelle, “You better stop.” It was a genuinely beautiful representation of squirrel fraaandship between Michelle and Ru — like when you were in middle school and tried to make your friends laugh during their presentations in front of the class. 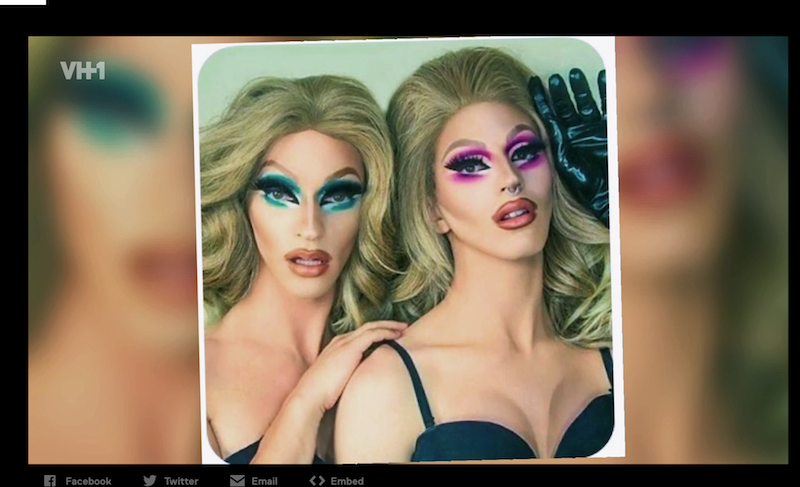 So we’re still of the belief that producers are shaping this feud between lookalikes Aquaria and Miz Cracker into the Season 10 version of Alyssa Edwards, Coco Montrese, and their bitter pageant past. As the girls talk backstage after the Episode 1 elimination, Aquaria tries to downplay her frustration with Miz Cracker’s similar face makeup. The Vixen, however, isn’t having it (GOD LOVE HER) and stirs. that. pot. like. Betty. Crocker. Bravo’s own Andy Cohen dons some Western-themed attire to make a guest appearance and help judge this week’s dance-centric mini-challenge, the “Hay Girl Hay Hoedown.” Seeing Andy and Ru try to line dance with each other was certainly a moment in itself, but did anyone else catch that Real Housewives-style greeting by the queens? They low-key say “Hi Anndddyyyy” with the same cadence as the housewives in the reunion specials. “Nicki Minaj-aj-aj it,” while instructing the queens to twerk. “You think you’re clever, don’t you?” when Kalorie tells her it’s KARBdashian, not Kardashian. “I’ve been in your pumps,” while commiserating with the stressed-out girls. Can Alyssa Edwards tongue pop and choreograph her way throughout this entire season? She explains that after watching Jujubee sashay down the runway on Drag Race Season 2, she began performing in drag to learn how to embrace her body. Then, it was the persona of Kalorie who taught her that she was beautiful. Jujubee tweeted her support during the episode. Catch next week’s episode of RuPaul’s Drag Race on Thursday at 8 p.m. on VH1!